update: More information in Phys.org's news item TESS mission to discover new planets moves toward launch, including a video of the telescope array's final assembly. Also see GSFC's TESS page. The question: Will there be "Near Space" Ka band allocations for TESS? is seeking a boolean yes/no plus addressing the item at the end: Are there now approved Near Space Ka Band frequencies, and does the Wikipedia article need to be updated? TESS has a group of four wide field cameras each with four large CCD imagers that will collect photometric data at a relatively high cadence, and therefore generate a ton of data. above: "TESS (Astro-EX 1) [MIT]" From Gunter's Space Page. DHU (Data Handling Unit): The DHU is a Space Micro Image Processing Computer (IPC-7000) which consists of six boards: an IPC (Image Processing Computer), which contains two Virtex-7 FPGAs (Field Programmable Gate Arrays) that serve as interfaces to the four cameras and perform high-speed data processing; a Proton 400 k single board computer, which is responsible for commanding, communicating with the spacecraft master avionics unit, and interfacing with the Ka-band transmitter; two 192 GB SSB (Solid-State Buffer) cards for mass data storage; an analog I/O power switch board to control instrument power; and a power supply board for the DHU. The CCDs (Charge Coupled Devices) produce a continuous stream of images with an exposure time of 2 seconds. These are received by the FPGAs on the IPC, and summed into consecutive groups of 60, giving an effective exposure time of 2 minutes. During science operations, the DHU performs real-time processing of data from the four cameras, converting CCD images into the data products required for ground post-processing. A primary data product is a collection of subarrays (nominally 10 x 10 pixels) centered on preselected target stars. The Proton400 k extracts these subarrays from each 2 min summed image, compresses them and stores them in the SSB prior to encapsulation as CCSDS packets for the Ka-band transmitter. Full frame images are also stacked every 30 minutes and stored in the SSB. Data from the SSB are downlinked every 13.7 days at perigee. At perigee, science operations are interrupted for no more than 16 hours to point TESS 's antenna toward Earth, downlink data, and resume observing. This includes a nominal 4 hr period for Ka-band science data downlink using NASA's DSN (Deep Space Network). In addition, momentum unloading is occasionally needed due to the ~1.5 N m of angular momentum build-up induced by solar radiation pressure. For this purpose TESS uses its hydrazine thrusters. The use of the higher frequency Ka band rather than X band or Ku band allows for a combination of higher speed and/or lower power and/or smaller high gain antenna dish diameter. According to Wikipedia's article Deep Space Bands, deep space is defined by the ITU as greater than 2,000,000 km from the Earth's surface. This excludes anything to do with the Moon's orbit and excludes the Sun-Earth L1 and L2 Lagrange points as well. It therefore excludes TESS' Earth orbit with its period of only 13.7 days. 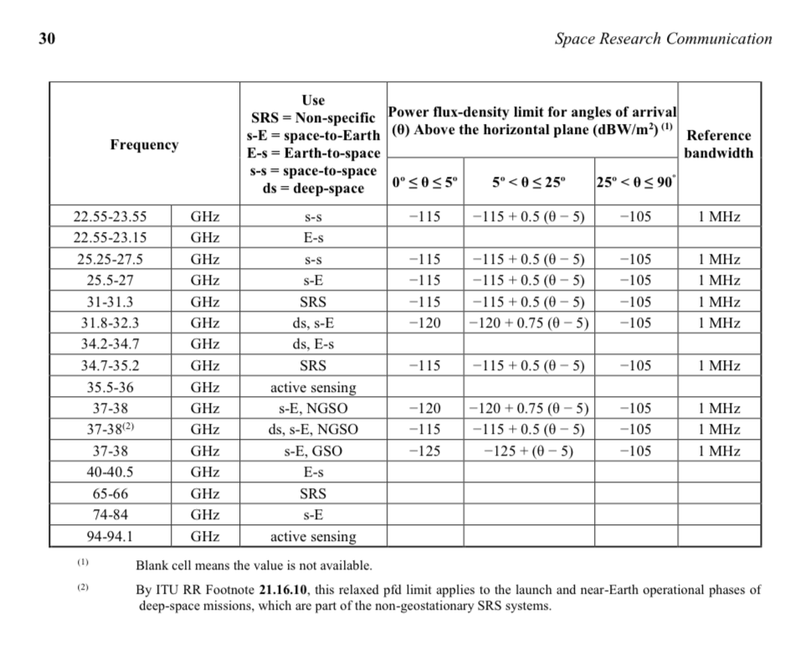 In the Wikipedia article, there are no entries for Ka band approved frequencies for near space; there is an asterisk which indicates No assignment or not supported by the DSN. And yet TESS will use the Deep Space Network to download its data - not TDRS. 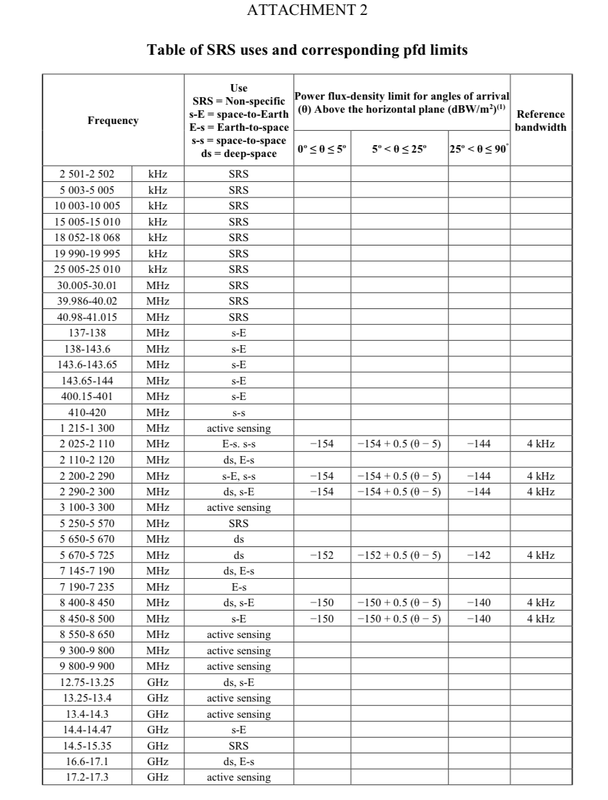 Are there now approved Near Space Ka Band frequencies, and does the Wikipedia article need to be updated? above: "TESS’s never-before-used P/2 orbit." Image: GSFC/NASA. 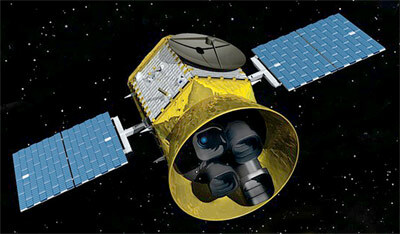 From Extreme Tech's NASA’s TESS mission on track to start hunting exoplanets in 2017. 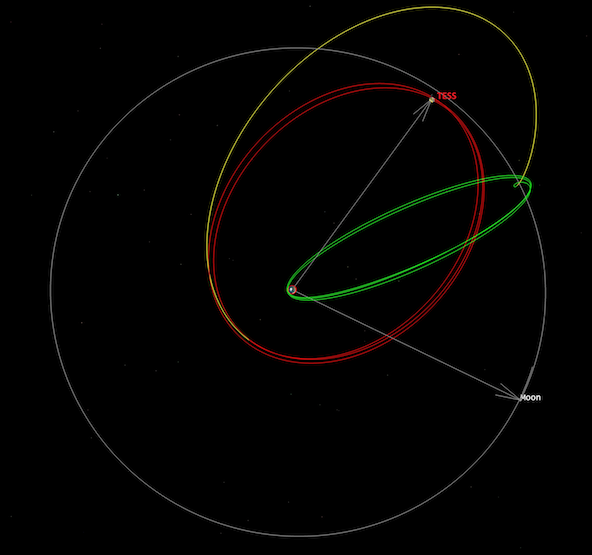 TESS' final orbit is the wider of the two complete ellipses (red) with periapsis near LEO and apoapsis near but less than the Moon's orbit. The period is 13.7 days, or half of the Moon's and phased such that the Moon will be leading or lagging by 90 degrees whenever TESS reaches apoapsis, in order to cancel the strongest of the perturbations from the Lunar gravity and give the orbit a stability lifetime of decades. All except "ds" are near-space allocations. There are Ku band allocations from 12.75-13.25 GHz and 14.4-17.1 GHz that can be used for near-space purposes. There are also multiple pieces of the Ka band that are available. Specifically on TESS, there's a vendor press release that says the transmitter is a software-defined radio capable of 25.25 to 27 GHz. That's allocated as space-to-space, and also covers a space-Earth allocation; both are considered "near-space" by ITU. There's a lot of discussion in the ITU system, and perhaps some action coming, on "near space" vs "deep space". (Only ITU member organizations can see the individual documents, unfortunately) That line is blurring, but there's still some utility to it... There's also a nice ITU publication that shows some of the logic behind selecting a band for near- vs deep-space use. As to the second part, should the Wikipedia page be updated, that depends on how much detail is needed. At a minimum, it should probably point to the current version of the DSN 810-005 guide, though that's giving the same table as is currently posted. Not the answer you're looking for? Browse other questions tagged communication radio-communication antenna tess or ask your own question. How do Field Programmable Gate Arrays affect the capabilities of probes?